The fifth and final number one from Westlife’s debut, “Fool Again” is an unhappy ending on every level. For once, the lads don’t realise their mistake in time to turn things round and win back their beloved. In fact – gasp – she’s found someone else, leading to a coda in which the band drop the creamy close harmonies and indulge in unrepentant yowling and breast-beating. It’s an undignified sound, but it’s the only musical distinction in “Fool Again”: otherwise we’re in well-ironed, not actively unpleasant Cheiron ballad territory. The guys are good enough anaesthetists by now that nothing grates, and perhaps if you shifted enough of the blanketing away you’d find a pea of interest in the song. But probably not. Still though, five number ones off one album: that’s something. Nothing good, but something. For all that a close look at Westlife’s success reveals how much of their record-breaking was down to canny singles placement – and beyond that simply luck – by now they appeared, in public, unstoppable. A band with a colossal fanbase, ready to sweep any challengers away. It would make the ride easier from this point. Westlife weren’t the only group to pump out singles from their albums – and while five releases isn’t exactly modest, it wasn’t absurd by CD era standards. REM’s much-loved Automatic For The People went one further, and five would have been at the low end of a Michael Jackson album campaign. Of course it’s the sustained success that’s remarkable – and that it was sustained by such ferocious focus on a target market. But you could – as “Go Let It Out” made clear – have said the same as Oasis. Westlife weren’t even loathesome: small girls and their mums are never well-respected by vocal fans of other music, so the group caught hate to a degree their competent music didn’t honestly deserve. It was awfully boring – “Fool Again” no exception – but it rarely imposed itself longer than a week. Still, a wider unease lay behind the groans at Westlife’s success – a sense that Westlife and Oasis and assorted trance hits might be part of the same problem: a pop culture whose connective tissue had atrophied, islands of fans with nothing useful to say to one another. Was that new? Perhaps not, but the giddy pace of the charts made it more acute. I don’t totally agree with that gloomy diagnosis: behind the scenes, the turnover of number ones in 2000 is mostly a function of labels gaming the chart system. But records like “Fool Again” remind me that sometimes the chart was also just what it looked like, an unmixed salad of records that treat fans as bank machines and either can’t keep a grip on a wider audience or never cared to in the first place. The last few days, I’ve been trying to pin down my dislike of Westlife. Pop prejudices are like any other prejudice; born out of ignorance, indifference and powerful propaganda (in the case of propaganda, read: rockism). I think all of these play their part in reinforcing my dislike of Westlife, but reading the Westlife threads we’ve seen so far, even the most ardent poptimist finds Westlife a sticky issue. If it’s what they do that makes my hackles rise, then I must be an enemy of pop? Well no, that’s a false dichotomy…think harder, TFG! Who’s pulling the strings? Walsh & Cowell. Yes, easy targets indeed, but James BC mentions Samantha Mumba who is undoubtedly agreeable, but the opposite gender to Westlife. How did I feel about Boyzone? Well, they were from my perspective on Popular, never not interesting, despite their wildly inconsistent output, but Ronan’s voice could so often be a dealbreaker. Westlife clearly don’t have a Ronan. All the boys can sing and deliver lyrics in a way that smooths out any, let’s call them “Ronanisms”. So ignorance can be dismissed right away, as WL were all over the media. Teh ‘Loife were one of the boybands that were widely acceptable on R1 & R2 playlists. They could turn up on TFI Friday or Lily Live! (iirc), let alone TOTP and other Pop programmes. Indifference is easy to own up to because I’m not WL’s target market. My then-wife and my daughter were, but they didn’t buy into their brand of pop, and they didn’t buy into BZ either. I’m not sure what that’s saying about any of us, other than we had other preferences, and at the height of their popularity, it was easy, often encouraged from some quarters, to diss WL. Which brings me to rockism. I’ll admit I was not the same man I am now, but still my active dislike for Westlife persists. I believed wrongly, that they were an assembly job, spoon-fed songs from some of the best writers available, the music produced and arranged by some of the best producers available and all they had to do was turn up, sing the lines and look pretty in the videos. This, of course, does everyone involved a disservice, because it likens pop to the manufacture of sausages. Pop is not Frankfurters in a jar. So why does WL feel like it is? Why do I think there’s something fundamentally wrong with everything they do? There’s nothing offensive, no controversial lyrics, no issues with delivery, nothing remotely ugly or unpleasant aside from their aggressive blandness. Is it their formulaic approach to pop? Their lack of ambition to subvert even their own cliched image? Is it their unassailable success in selling what is essentially an unchanging product? And that takes me back to Walsh & Cowell, who are the ones who did the selling, not the boys from Sligo alone. Shouldn’t I be hating on them instead? More on them as Popular’s story unfolds, without doubt. But I’m still left with the nagging suspicion that I dislike Westlife for no other reason than good old fashioned pop prejudice. What a Git! I think Westlife lose their grip on stultifying competence quite quickly after this, FWIW, and are forced into (or lunge at) more variety. This isn’t the last of their number ones to get there based purely on them doing their thing, but their imperial phase doesn’t last too much longer. I share TFG’s faint concern over my rote dislike for Westlife, and have tried to be fair to them. The problem is that even when they do nothing wrong it’s devilishly hard to see what they do right. It’s bugging me now, there’s a rock song that has this or something very similar. Its not that “I thought love would last forever, I was wrong” but what is it? It is, well done thanks. To be fair to Westlife fans I think whether I was a discusser or not I’d think twice before piping up if I came on here and seeing a string of bad reviews and worse comments! Not to mention us old giffers trying earnestly to analyse the appeal. It would be like walking into a petri dish! A glance at the Westlife tag on Tumblr and at the Facebook page suggests that the fandom articulates itself in much the same ways as every other fandom though with fewer stresses and faultlines (naturally enough since the boys’ story is essentially over). There’s a nice line in 1D fans looking to these elder statesmen of boyband-dom for lessons and hints as to the longevity of Harry et al, though. The Facebook fandom seems very heavily Asian. Not sure whether this is a) simple demographic weight, b) because the ex-members are particularly active out there, or c) because Westlife songs are closer than most Western pop to C-pop ballads (and other Asian pop strands’ balladry). I don’t really have any grounds for c) but I include it because it’s a bit more interesting than the more likely reasons. The missus is a Westlife fan, but it doesn’t seem to be the type of fandom that requires particular devotion or deep analysis. She would watch them when they were on telly, but they were on telly a lot so there was no real effort to seek them out. She got the albums for Christmas because that’s when they came out; they made for a nice, easy present for someone to buy. She went to their concert once a year, with the girls, which was a good way of making sure they all did meet up and nobody cried off. She’d make sure she had the most recent cd in the car that week so she’d know any new numbers they wheeled out. I don’t know whether any individual songs stand out but they do seem fairly similar to me; which might be expected if they are to soundtrack reliably nice times. In short, Westlife met needs – same as any other band I guess, only these needs seem rather more banal than Bowie or the Manics. I’d be interested to know how their demographic skewed agewise? It’s hard to imagine they were meeting the same needs as, say, Take That at their most buffed. Can confirm, Westlife are still huge in China, see my comments on other WL threads for details. Why? Not sure, but music being able to fit into the background and not offend anyone seems like the best of all worlds here, especially if you can’t tell what they are singing. Fundamentally this may be to do with not valuing music, especially pop music, so highly – it’s not associated with rebellion or defining who you are. Good music is usually “nice” and “relaxing”, bad music is “noisy.” Not saying this is true of everone here, but at least 90% of the people I meet, probably more, and my sample is heavily skewed towards more Western-facing Chinese people. I think this was the single that pushed me over the edge, Westlife-wise. It’s not noticeably worse than anything they’d done before, but five consecutive number ones pushed them into real phenomenon territory, and I remember being infuriated by the *injustice* of it all. My experience of the pop charts to this point was that number ones *mattered*. Some crappy or superfluous ones slipped through, but there was a rough sense of meritocracy. The Spice Girls ruled the world from 1996-1998, so all (bar one) of their songs went to #1. Britney and Madonna had #1s. Robbie Williams had #1s. Occasionally a long-serving second-division player would get to be at #1 (Five, Gabrielle etc.) That Westlife could essentially release the same song five times in a row and get to #1 every time seriously offended my sense of pop justice. Eventually I came to see them as sort of top 5 squatters. I didn’t like or understand them, but their presence was inevitable and the only recourse was to ignore them until they went away again. I can look on them more charitably now – if anything this is Westlife at their best, before they completely lost all veneer of ambition and became almost exclusively a covers act. That they released far worse and lazier records than this isn’t much of a recommendation, but it’s the best I can come up with. * I don’t recall being as irritated by Boyzone – aside from the time they had the audacity to thwart Geri Halliwell – but I was younger and even if they were arguably even more cover-reliant than Westlife, at least their songs were generally quite distinguishable from one another. Is there any sort of study compiling the sort of ‘customers who bought x also bought y’ sales data? I’d wager Westlife and Boyzone have a huge chunk of their audience who didn’t buy much else. I.e. As Tom said in earlier WL or BZ piece, they didn’t get much out of the rest of pop music. C.f. Oasis, Weller and Kasabian, though those artists spawned hoards of imitators whereas, while there must have been plenty impresarios trying to launch ‘the new Westlife’, I can’t think of any who’ve had any real chart impact. Bunn-A1 maybe? That lot hit biggest with a very poptastic cover version and a Max Martin knockoff though – they had the lack of threat thing but were ending up at a very different place. More on them anon of course. A1 never struck me as an attempt to replicate the Westlife formula. They were much more in the cheerful 5ive/Budget Backstreet Boys mould. In fact Westlife imitators were quite thin on the ground that I recall. D-Side were the most obvious ones, but they came and went very quickly. I wish Westlife Woman was in common lazy demographic parlance like Mondeo Man. The opening three seconds sound like “Where Is My Mind!” Sadly, all downhill from there. 2. So Westlife is the most popular Western act at karaoke joints… better known than Michael Jackson, for example. Largely popular because it’s easy to sing… pop culture completely revolves around karaoke there, not exaggerating, half the channels are just karaoke music videos, so ability to take part is something we may be overlooking. Considered “cool” by the young crowd (and before we judge, what do “hip” Arabs think about the West’s recent love affair with Omar Souleyman?). Especially popular with men… the equivalent of Britney Spears for women, but both have become somewhat passe the past five years. They have unquestionably influenced the music scene there, including with direct translated covers. I can say that the one redeeming feature of the band — the close harmonies — are not emulated. Harmony is not a part of the East Asian musical language; pop music there is all about vocal emoting. I specifically asked her if the harmonies are part of the appeal and she’s vociferously denying that (though it could be, unconsciously.) While rhythmically they are certainly more laid back, lyrically they aren’t at all. Sean Kingston’s “Suicidal” was probably the biggest Western hit of the decade… extreme emotional responses like that are big in pop music, the singers often weep throughout the song. Discussing Westlife again is getting tiresome and we’re still about only halfway through. Such was the inevitablity of Number 1’s after a year it was hard not to have an aversion to Westlife. 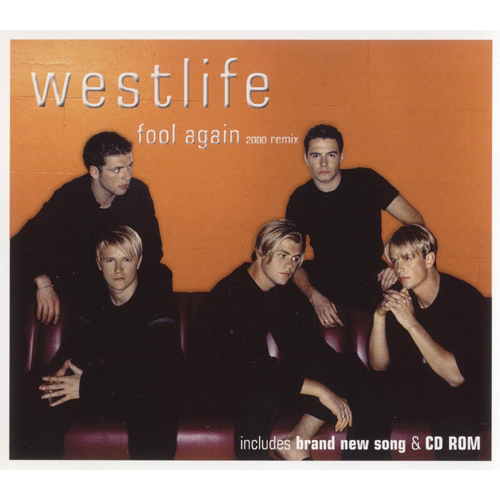 Fool Again felt like something put together in a 3 minute countdown and all the westlife traits are present and corrrect – 10 15 seconds of intro,almost quietly spoken first verse, punching the air chorus, then a big shout about 3 quarters in. You could actually make it up! 3 or a 4 from me. All that I can take from this if Mexico was the setting then its no surprise that the budget was restricted to Ireland for the next bunny. Awful song from an awful band (would they know the difference?) that sounds like it was produced sloppily by a child very disjointed and weak. Fool Again is clearly the unfortunate naïve kids buying Westlife records again.